You need to have your will and other legal documents up-to-date in order for your family to carry out your wishes. We can prepare these documents for you. What will happen to your family if you are incapacitated? You need a qualified estate planning attorney help you understand what these documents can do for you. Protecting your sensitive information is essential with everything connected to the Internet. If you're in charge of finances and are incapacitated, how will your spouse know how to transfer essential funds during a hospital visit? Slape & Howard can help you arrange for such unfortunate circumstances by setting up a guide to your digital assets. This includes bank account passwords and usernames. In the event of your death, there are expenses to be covered. If your spouse or partner cannot access the necessary funds for making your arrangements, complications arise you had not anticipated. We can ensure an authorized individual will have the necessary tools to ensure a difficult situation. You don't want your family to be saddled with extra taxes and trauma after your death. Let us help you properly prepare a will or trust for you. Set up an appointment with one of the attorneys at Slape & Howard and learn how you can protect your legacy. If you haven't planned for the future, the present is the best time to start. Knowing what will be important to securing your assets and legacy for your family is a part of estate planning, and the attorneys at Slape & Howard work to ensure you have everything covered. 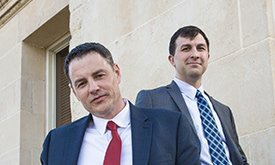 Set up a consultation with one of our attorneys in Wichita to start the process of protecting your future and that of your family.